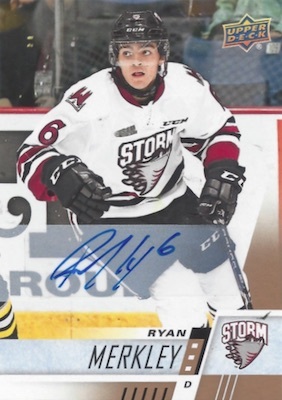 Harkening back to hobby days when UD regularly issued Canadian Hockey League sets, 2017-18 Upper Deck CHL Hockey restarts the coverage for Canada's major junior teams. 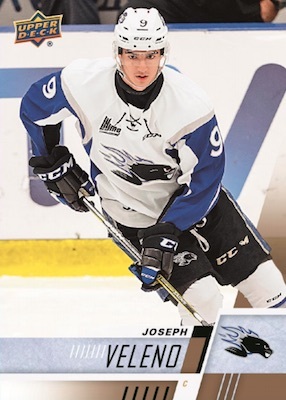 Although Leaf previously issued CHL cards, Upper Deck once again holds the exclusive license for the Canadian outfit that includes the Ontario Hockey League (OHL), Quebec Major Junior Hockey League (QMJHL/LHJMQ) and Western Hockey League (WHL). With a robust base set of 400 cards, the 2017-18 Upper Deck CHL checklist offers an average of 6-7 cards from every team. Of that amount, the first 300 are standard base cards. The final 100 cards highlight short-printed Star Rookies. These also include Exclusives (#/100) and High Gloss (#/10) versions. In addition, base Autograph cards average one per box. Although the set is fairly simple, 2017-18 Upper Deck CHL Hockey contains several inserts to chase. Promising Futures and Top Prospects Game cards combine to come six per box. Much more elusive, the Season Highlights insert falls once per inner case (1:10 boxes). Odds Key: h=Hobby; e=ePack; b=Blaster. 400 cards, including 50 short prints. Shop base sets on eBay. Star Rookies SP odds - 1:1.5 Hobby/ePack; 1:1 blaster. BASE PARALLELS (#1-300): Red Border (1:2 b), Printing Plates 1/1 (h/e). 101 cards. Shop autographs on eBay. Overall odds - 1:13 packs. 18 cards. 1:160 Hobby/ePack, 1:1,600 Blaster. View the 2017-18 Upper Deck CHL checklist spreadsheet. Does this mean Leaf/ITG won’t be making their signature ITG heroes and prospects this year? When will the checklist be released? When will the checklist be released? Looks interesting. Just broke my first box of this and I LOVE it! Being in a CHL city, it’s great to have a deep set with local guys I can sell and kids can get signed, and the boxes and packs are reasonable. In my box I got six cards of my local team, an autograph, a printing plate and a Star Rookies Exclusive – pretty good value for a box which should be around $70CDN tax in! Think I’ll be busting a case! The base cards shoulf have offered a bit more “pop” for UD’s return to the CHL. Opened 2 boxes, had 2 Auto’s in one box and 4 in the other. Also hit the Season Highlight “case hit” in the same box as the 4 auto’s. 5 Stars all the way. Very nice cards. A huge checklist, many autos and high gloss cards! A true success. I don’t understand why they don’t release this every year! This is a gorgeous set with some BIG name rookie’s in it. The Star Rookie class is filled with names such as Alexis Lafreniere (consensus #1 overall pick in 2019) and others such as Bowen Byram (#1 ranked d-man going into this years draft) as well as a ton of other highly ranked or already drafted prospects. The signatures are awesome and my only complaint would be that they are stickers and not hard-signed but I guess the price makes up for that. Some cards in this set have already gone into the $150-$200 zone such as Alexis Lafreniere’s signature Star Rookie and his Exclusive card while his HD card is selling in the $1,000’s!! !